The fleet ballistic missile nuclear submarine Mariano G. Vallejo was laid down 7 July 1964 at the Mare Island Division, San Francisco Naval Shipyard, Vallejo, Calif.; launched 23 October 1965; sponsored by Miss Patricia O. V. McGettigan, great‑great‑granddaughter of General Vallejo; and commissioned 16 December 1966, Comdr. Douglas B. Guthe (blue crew) and Comdr. John K. Nunneley (gold crew) in command. Mariana G. Vallejo, with two complete, equally trained crews, rotated at regular intervals to maximize patrol on station time, conducted shakedown and training exercises along the west coast, in the Caribbean, and off the coast of Florida. Transiting the Panama Canal for the second time on 21 March 1967, she headed for her assigned home port, Pearl Harbor. Arriving 10 April, she continued training exercises and sound trials, then returned briefly to Mare Island. 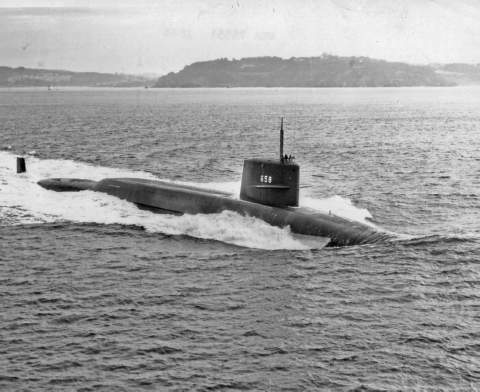 Thence she sailed back to Pearl Harbor, becoming, as of 1 August, an on‑the‑line unit of Submarine Squadron 15. Since that time, into 1969, she has conducted deterrent patrols as a unit of the Pacific Fleet.